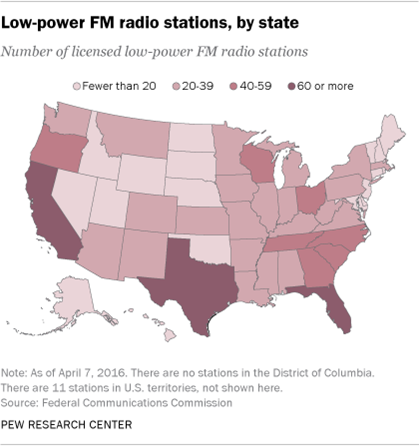 More than 750 new low-power FM (LPFM) community radio stations have been licensed to join the FM airwaves since 2014, according to the Federal Communications Commission. This has nearly doubled the total number to more than 1,500 LPFM stations across the U.S. and its territories. LPFM stations are spread across all 50 states. Twenty-two states have a moderate number of stations (20-39), though three have more than 100 stations each: Florida (121), Texas (114) and California (102). Additionally, a combined total of 11 LPFM stations are operating in the U.S. territories of American Samoa, Guam, Puerto Rico and the U.S. Virgin Islands. The LPFM stations serve both rural and urban communities, but with an operating range of 100 watts or less, most have a broadcast reach of just a few miles and cater to intensely local and niche audiences. The FCC created its Low Power FM service in 2000 in an effort to better serve local communities following a wave of consolidation in the industry and combat the proliferation of unlicensed, primarily low-power “pirate” radio stations. LPFM stations can only be licensed to not-for-profit educational organizations and institutions, government or non-government entities that provide public safety radio services, or tribes and tribal organizations recognized by the federal government. These are stations like KALY-LP, aimed at the Somali-American community; WIUK-LP of Iuka, Mississippi, which combines a religious mission with animal advocacy; the student-run local music station of Rice University in Houston, which turned to the low-power format after the university sold its original station license; and WHIV, a New Orleans-based station run by a local community activist. In other cases, LPFMs are run by municipal entities such as the Simsbury Volunteer Fire Department in Connecticut or the city of San Marcos, Texas, both of which air emergency and public service announcements. LPFM stations operated by tribes or tribal organizations include KCUW-LP, which launched in 2004 on the Umatilla Indian Reservation near Pendleton, Oregon, and mixes music and traditional storytelling with talk programming on topics such as gang awareness and breast cancer; and KPYT-LP, located on a reservation southeast of Tucson, Arizona, which is run by the Pascua Yaqui Tribe and offers programming in the Yaqui language for older residents who don’t speak English. 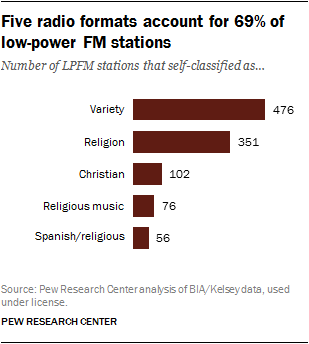 Five specific, self-identified radio formats accounted for 69% of the 1,536 LPFM stations, four of which are religious in nature (“religion,” “Christian,” “religious music” and “Spanish/religious,” according to data from BIA/Kelsey). The most common format named was “variety” (476 stations) – which spanned such organizations as the Gourd Farming Educational Society, Northland College, and the African American Family and Cultural Center. Other format categories included “information” (36 stations), “oldies” (31), “alternative” (29), “country” (15) and “ethnic” (10). Many stations offer a mix of locally originated programs with syndicated shows. As with any media venture, LPFM stations must find a way to pay the bills to cover equipment, office space and operating expenses. Groups have used various strategies to raise money. WNHH in New Haven, Connecticut, a project of the New Haven Independent, received grants, while other stations run modest, locally based fundraisers. Still others, such as Takoma Radio, have turned to crowdfunding sites such as Kickstarter or Indiegogo. The FCC has not indicated that another window for applications will open any time soon. As of the beginning of 2016, around 100 applications were still in process.